Elf and Yoli are sisters. While on the surface Elfrieda's life is enviable (she's a world-renowned pianist, glamorous, wealthy, and happily married) and Yolandi's a mess (she's divorced and broke, with two teenagers growing up too quickly), they are fiercely close -- raised in a Mennonite household and sharing the hardship of Elf's desire to end her life. After Elf's latest attempt, Yoli must quickly determine how to keep her family from falling apart, how to keep her own heart from breaking, and what it means to love someone who wants to die. 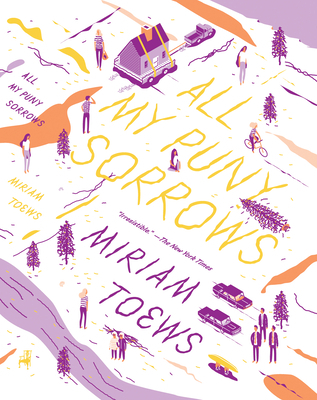 All My Puny Sorrows is the latest novel from Miriam Toews, one of Canada's most beloved authors -- not only because her work is rich with deep human feeling and compassion but because her observations are knife-sharp and her books wickedly funny. And this is Toews at her finest: a story that is as much a comedy as it is a tragedy, a goodbye grin from the friend who taught you how to live. Miriam Toews is the author of five previous novels: Summer of My Amazing Luck, A Boy of Good Breeding, A Complicated Kindness, The Flying Troutmans, and Irma Voth, and one work of nonfiction, Swing Low: A Life. She lives in Toronto.